- Press Release – September 22, 2011 On Wednesday, Spetember 21, 2011, and in celebration of the 30th Anniversary of our Nation’s independence, Tropic Air offered all Belizeans the chance to travel anywhere in the country for only $21. 818 of you celebrated with us by taking us up on our offer. Some of you went to San Pedro for lunch, others to visit family in Punta Gorda. Some went to Belize City for the parade, others went to Belmopan for the official ceremonies. Some of you went to Placencia, Corozal and Dangriga for the day, others decided a day in Caye Caulker and even Sarteneja sounded so nice. Quite a few of you flew for the first time, and this brought a big smile to our face. While as a company, the expense of this commitment was significant, we were glad that so many of you enjoyed it and spent the day celebrating with us. And for those who flew for the first time, we are glad we could able to show you the convenience, ease and value of flight. Just like you, we are proud to be Belizean. Tropic Air would also like to thank all its staff for helping to make yesterday possible for their fellow countrymen. Without the support crew of ground handlers, pilots, operations staff and airport crew, yesterday would not have been possible. 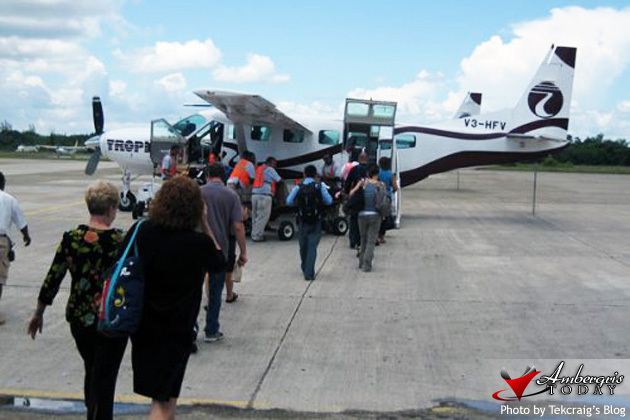 Tropic Air operates a fleet of 11 aircraft (including the lastest generation, G1000 “glass cockpit”, air conditioned Cessna Caravans) to 11 destinations in Belize and Guatemala. With over 250 employees, Tropic Air carried 200,000 passengers in 2010. For more information on sales please contact Julie Kee at [email protected]. Thank You Tropic. How about a 25 dollar deal for Christmas or a 31 dollar dear for December 31. Happy customers make a happy airline.